The results were almost unbelievable. As a woman in her mid-twenties (who works as an editor nonetheless), I’m ashamed to admit that I have never visited a dermatologist. To be honest, I never found the need to because I used to have really easy, low-maintenance skin. Key words there? “Used to.” In the past year my skin has gone from 0 to 100 real quick, in the worst way possible, and I am now finding myself willing to try anything and everything to get it back on track, which is exactly how I found myself seated in a plush white leather chair at Toronto’s new Skin Health Clinic—the same location as Reviv Wellness Clinic (they are run by the same people), where I tried my first-ever vitamin IV fusion—remember that? This time I was in for a DF Vitamin Infusion face mask (clearly I have a thing for vitamins). To start, my face was cleansed of all makeup, a white headband was wrapped around my head and a towel put across my chest in case of any spills. We started with Environ’s Cool Peel, said to be more precise and more safe than a standard peel, with no downtime. The peel was applied by way of a small brush (similar to a paintbrush) and felt phenomenal—a little cold, and very refreshing. I lay in bliss with this on for about five minutes before having it removed with a toner. Then it was time to get down to business. The DF Vitamin Infusion mask uses low-frequency sound waves and electrical currents to penetrate the skin, and although this sounds pretty damn crazy, it wasn’t at all intimidating. 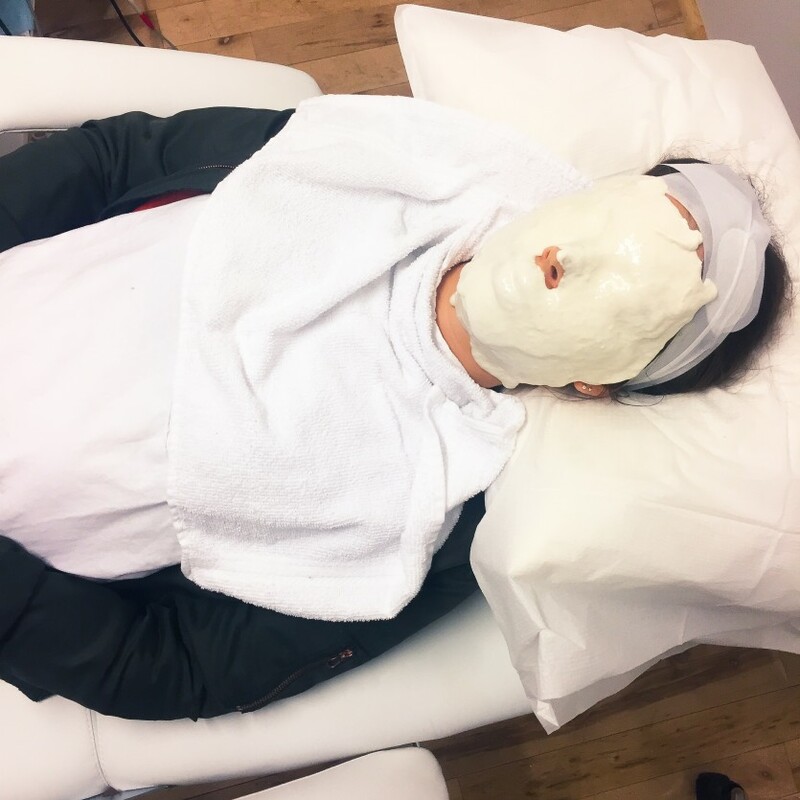 My Skin Coach and Registered Nurse, Melissa Munro, explained every single step in full detail, making sure I was comfortable with the process (especially seeing as how I was a facial virgin). She started by asking if I was okay to have both my eyes and lips covered with the mask as I wouldn’t be able to move for the 15 minutes that it was on—I’m not one to be claustrophobic, so I decided to just go for it. Prior to the actual masking, she painted Environ’s vitamin A and C serum on my face to hydrate my skin, balance out my uneven skin tone, and repair sun damage. Following that, she applied the Alginate masque, about one centimeter thick. It’s said to soothe your skin and normalize pH levels, and is a combination of Algin, fresh water algae extracts, and trace minerals. Small wires were then connected to the edge of the mask and I placed my hand on top of a jelly substance—all of this being connected to the Environ lonzyme DF Machine, which is what delivers the sound waves and electrical current. The sound waves (sonophoresis) “create cavitation of the skin cell membrane,” which increases the penetration of the active ingredients in the mask, and the electrical current (pulsed iontophoresis) “deliver active molecules deeper into the skin through the continuous breaking and re-associating of positive and negative ions.” Seems like a whole lot of science for a facial, but I promise you hardly notice anything besides a slight hum through your body and an occasional dim flash of light, which is all normal. The hardest part for me was lying there for 15 minutes without opening my eyes or mouth, but I got through it. Fifteen minutes later I was being disconnected from the machine and the mask was peeled off my face, all in one motion. My skin was slightly irritated in the areas that I had a few pimples (which I was told was normal), but besides that, the rest of my face looked plump and hydrated. The following morning all signs of irritation were gone and I had a slight glow to my skin. Any bit of dryness I had been experiencing 24 hours earlier was completely gone—it looked like I had been on a tropical vacation. Trying to get glow-y skin is an addiction of mine, so this facial is something of a dream come true. 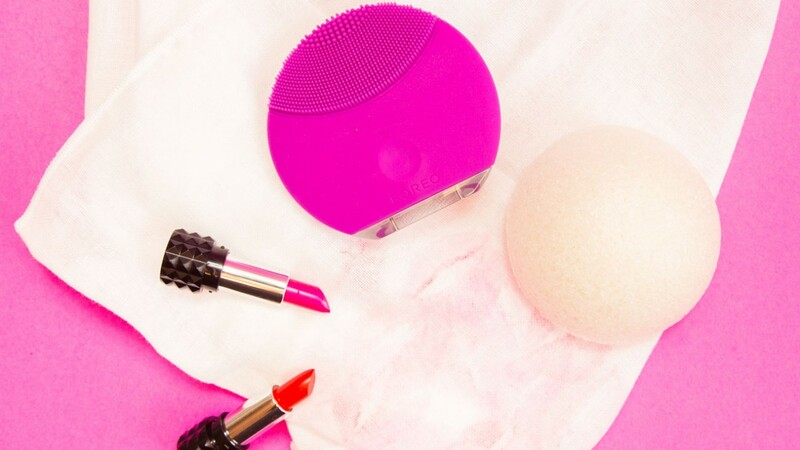 Easy, painless, and quick. I can definitely foresee myself going back for a second treatment at some point, and am almost mad at myself for waiting this long to begin with.